A few months back, I wrote an article on the Eames exhibit here in Los Angeles, and afterwards, was contacted by Deborah Sussman, curator and former Eames employee, to have lunch at her house to discuss art and design. We spoke for three hours and would move from room to room just talking about the style of the house, the shelves, the teapot, the lamp, her photographs, and other personal keepsakes from traveling, so delicately placed throughout. She was so cute about it– less apt to talk about its monetary worth, more excited to share the story of how it arrived in her home. This is a woman who was taught painting by Franz Kline, who took courses at Black Mountain, who designed the 1984 Olympics. Yet, all her accomplishments and accolades did not sour her childlike delight in discussing the origin of her artifacts– how each object had a maker who was a dear friend or a giver who was equally as special. Her design reflected her life, her story, her intention. Her enthusiasm was so raw and unclouded. Admirable. I mention my meeting with Deborah only because it relates to my meeting with Annie (pictured above– in our Eames “knock-off” chair nonetheless! 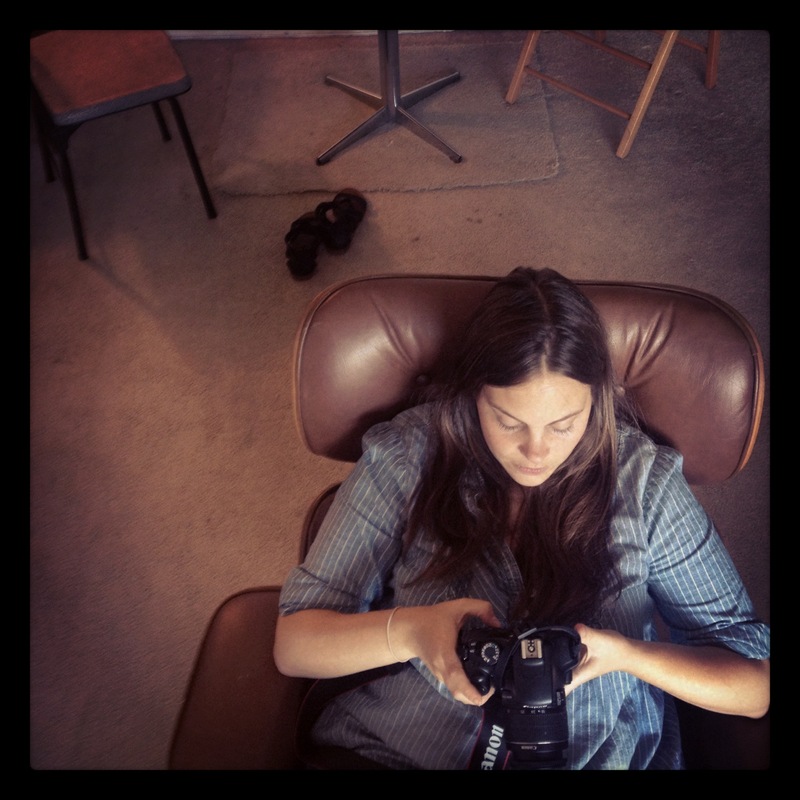 ), who recently took photos of my apartment for her blog, Sun & Glory. I just love spending time with Annie. Like Deborah, Annie’s a tactile person who learns by doing, and teaches by sharing her own process with others– openly, lovingly, courageously. For both women, collecting objects in the home is not about prestige, but the genuine story attached– what we decide to keep in our home says so much about where we have been, who we are, and how much we have changed or grown or loved. It is an intimate gesture to want to explore and document someone’s home. It is an intimate gesture to invite someone inside. As soon as Annie unpacked her bag and started taking photographs of our apartment, I found myself suddenly realizing which stories I wanted– needed– to share. I started understanding why I keep what I keep, and recognizing the importance of my relationship to these objects. Annie was genuinely interested and the story sharing didn’t feel like showing off, it felt vulnerable, exciting. Deborah’s energy was in the air! I would have hoisted a Picasso . . . if I were lucky enough to own one! I hoisted a tin can with a few nickels inside instead! HA! Afterwards, I considered the visit fascinating. I am someone who writes articles about other people. I am the person at the party asking more questions than answering. Often, I am not comfortable being the center of attention. But with Annie, there was no pressure to say the right thing or act “interesting”– I didn’t have to be wise or clever. I could just talk about the objects instead, and in between me and the objects, Annie found my own personal visual history, one that I wasn’t even aware existed until afterwards. Like my visit with Deborah, it was incredible. I am fortunate to have such thoughtful and artistic friends. Visit Sun and Glory to see the beautiful photos Annie took!